It is Tiddly Friday time and as we’re very close to Christmas, I’ve opted for making a Christmas card: a blue one! The stamp I’ve used is the super cute Reindeer Games. I’ve kept the card simple by framing it with some blue card stock, a sentiment by Huldra Designstudio and some silver rhinestones. 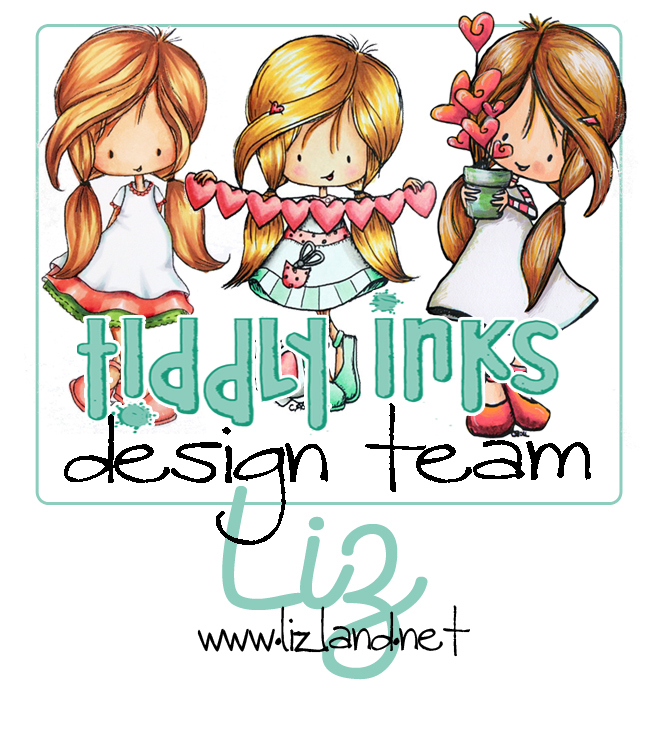 Oh and did you know that Tiddly Inks is having a sale this weekend? Though Monday 26th November you can get 45% off by using the code THANKSG18! Crazy! Check the main blog for more details. It’s the middle of the month so we are ready for a new challenge at Copic Marker Norge. 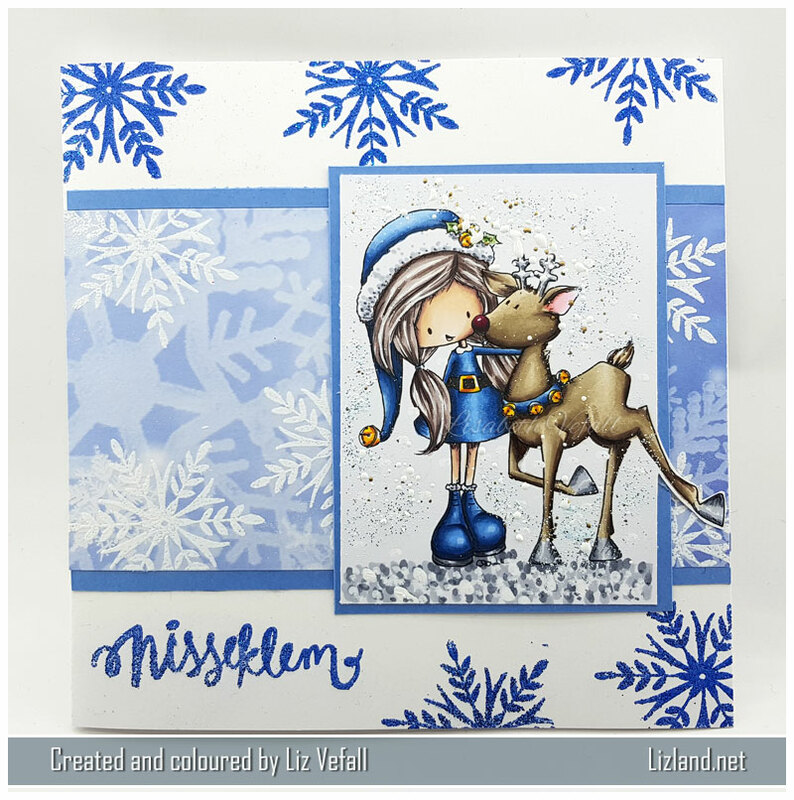 This time it is one of my favourite themes: blue Christmas! You have until middle of January to enter. I have made a plain card this time around. I like my Christmas cards to be reasonably plain this year as you might have figured out already! The image is by Tiddly Inks, and is one of my favourite images for Christmas cards. It is called Reindeer Games. I’ve coloured it in with copics, but not the usual combinations. Both the blues and the colours I used for the hair are new copics I hadn’t used before. I like them! 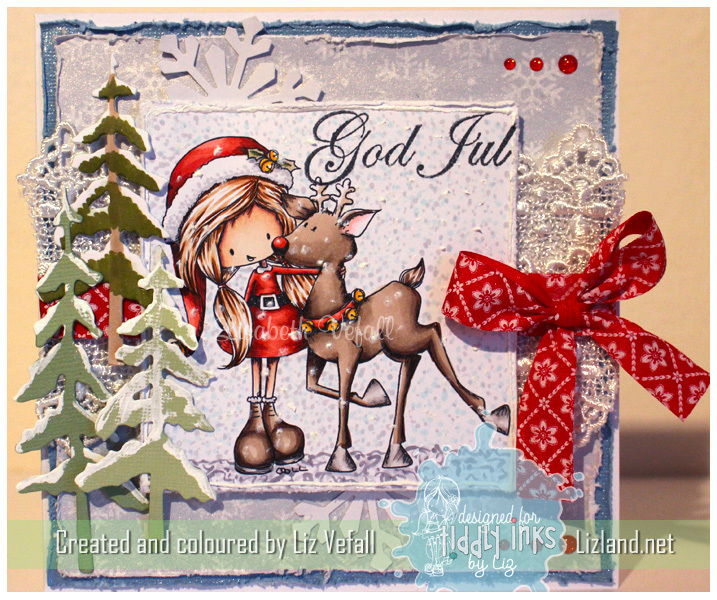 The background is made with a snowy background paper to which I added white embossed snowflakes. 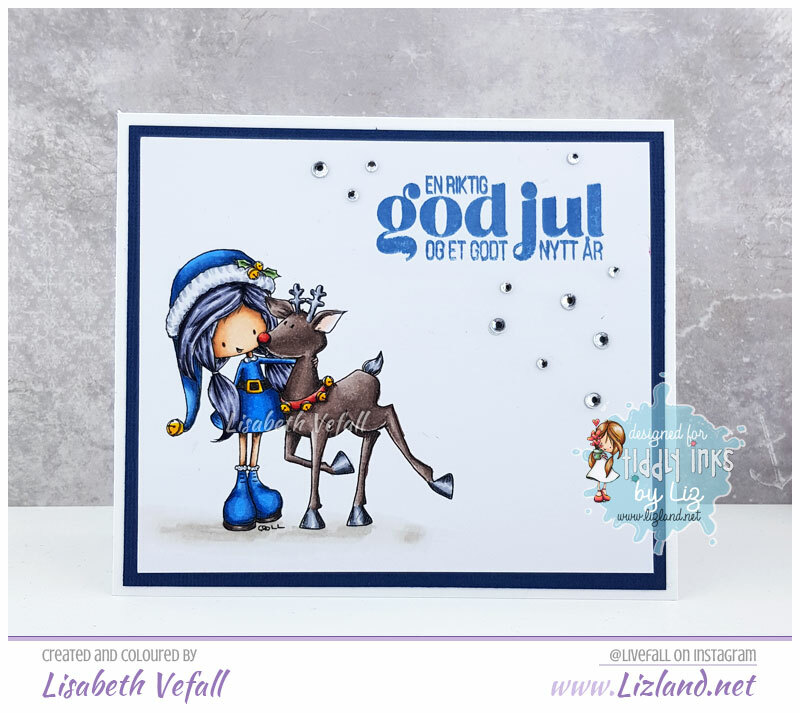 I added the same snowflakes around the card using blue glitter embossing which I also used on the text stamp, which, by the way, is by Norsk Stempelblad and means “Santa hug”. And another photo, because why not! 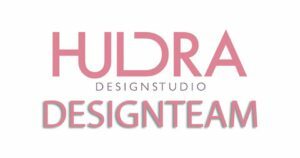 It has now been a full year since I got the honour of joining the Copic Marker Norge design team. Time does fly when you’re having fun and I feel it’s a great experience being on this team with such great talent! 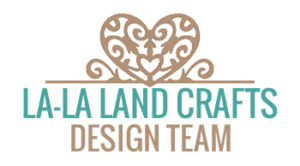 It’s always inspiring to see what these wonderful ladies come up with! The card I’m showing today is using an image from Tiddly Inks, which I have coloured in with copics. The snowflakes are by Panduaro and the lace is from Live and Love Crafts. Lastly I’ve added a dash of frantage over the distressed edges to give a bit more of a winter feel. In December we host an Advent Calendar at Copic Marker Norge lasting up until 24th of December which is the main day for Christmas celebrations in Norway. Every day there’ll be a new inspirational coloured craft, a Christmas song and some tips or a recipe or other fun things. Two days ago I kicked it all off with my card. 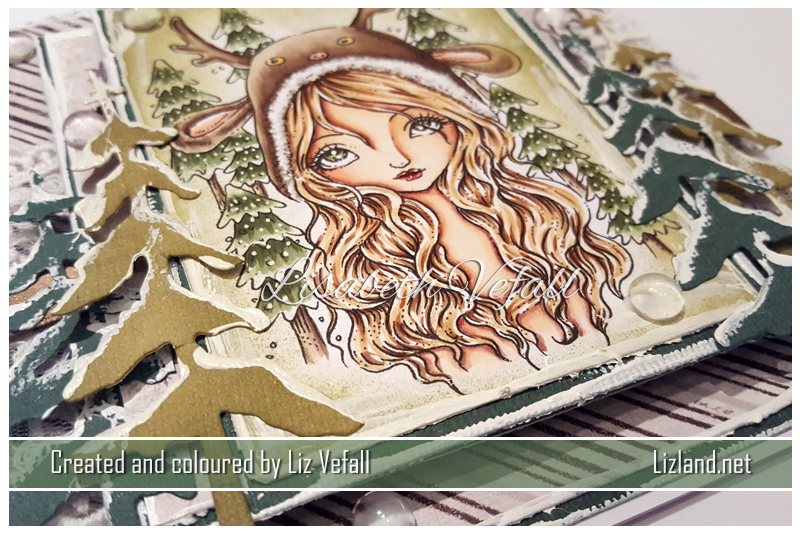 I felt Christmas was still a while away so I decided to keep it more winter and woodland themed using an adorable image by Ching-Chou Kuik. I bought it before Christmas last year, but never got around to using it. I’m quite pleased how it turned out both colouring and card wise! 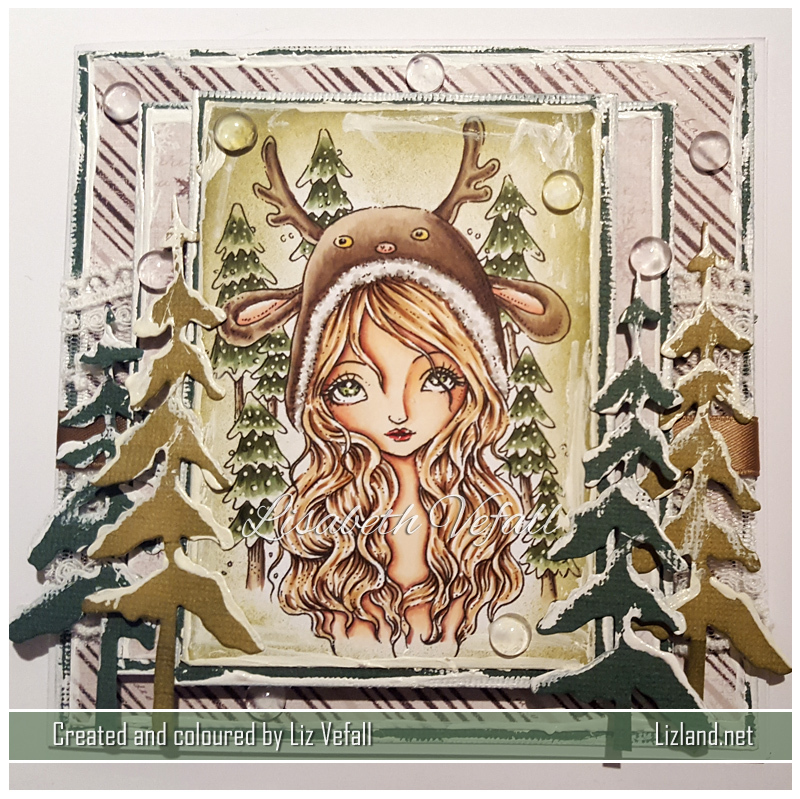 The dies are from Noor Design, I used distress ink and acrylic paint, as well as some lace from Live and Love Crafts. I thought I’d share an angled photo as well so you can see the layers a bit better. It’s Friday and a fab one at that! I can’t believe it is Christmas next week. In less than a week even, as we celebrate on the 24! That means I know what I have to spend my weekend doing: making Christmas cards! I certainly don’t have time to make any other cards if I want to get it all done. My wrist has been acting up the past few weeks, but it seems colouring is fine unless I spend all doing it.. so yey! I don’t have to rush out and buy Christmas cards! Thank goodness! 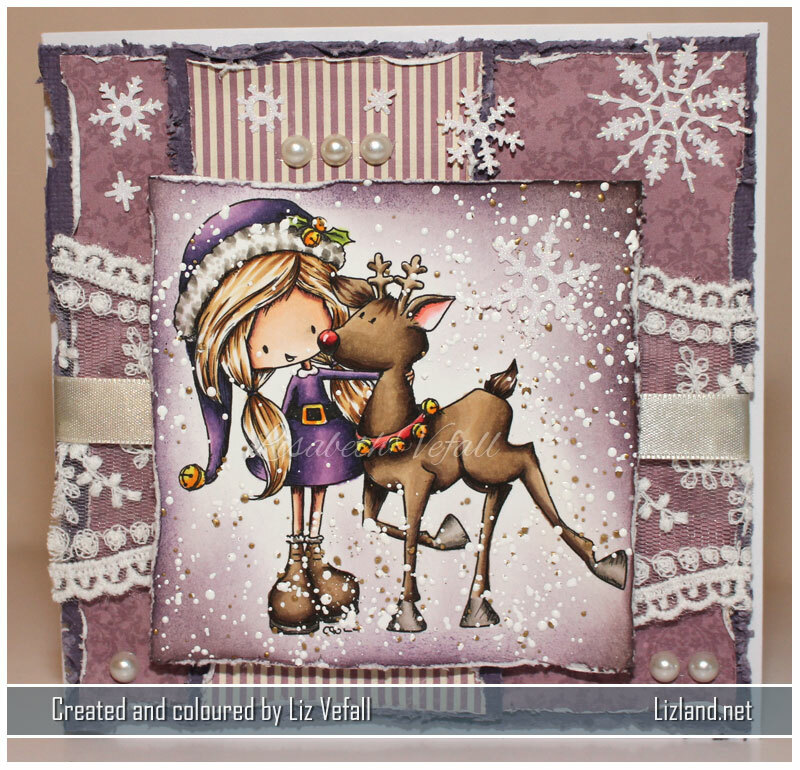 If you want lots of inspiration for Christmas in particular, pop over to see our creations at Tiddly Inks! 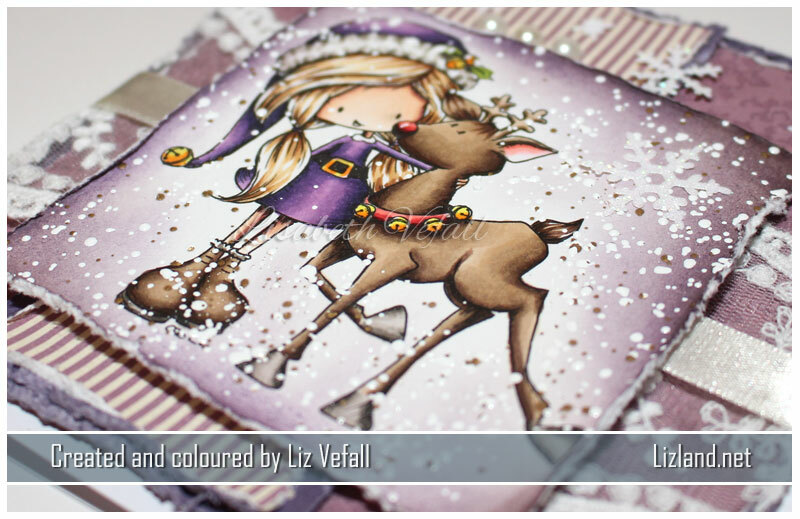 For this card I’ve used the adorable Reindeer Games and coloured it in with copics! Don’t you just love it?! Of course the card is blue. Is there any other kind I’ll soon start to wonder.. heh. I bought the lace at KaBoks, used Noor Design tree dies and a Martha Stewart snowflake puncher! Additionally I used a snow pen for the snow effect and a Panduro sentiment stamp.